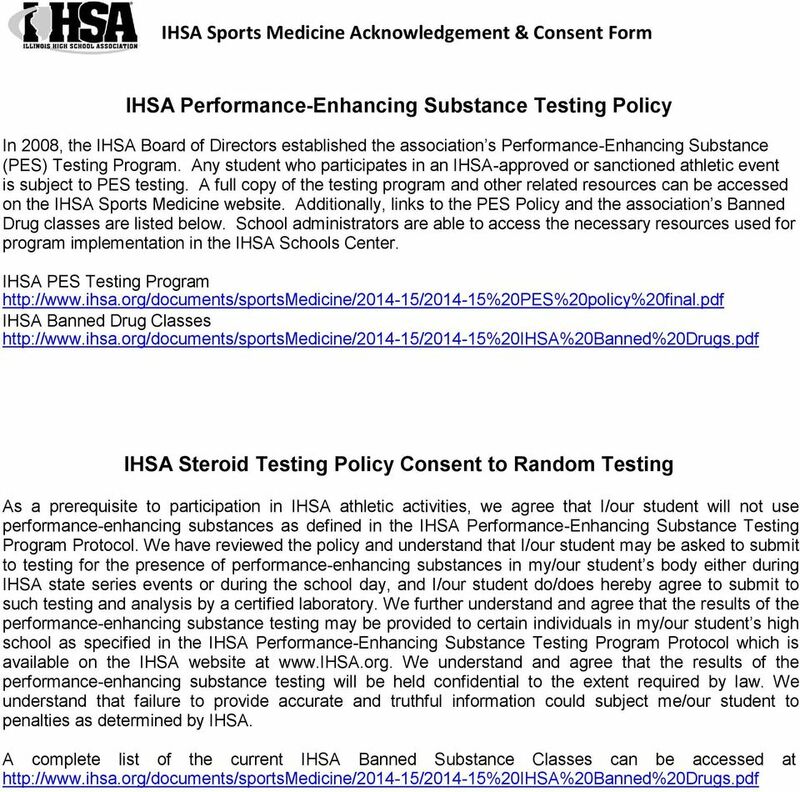 Download "IHSA Sports Medicine Acknowledgement & Consent Form. 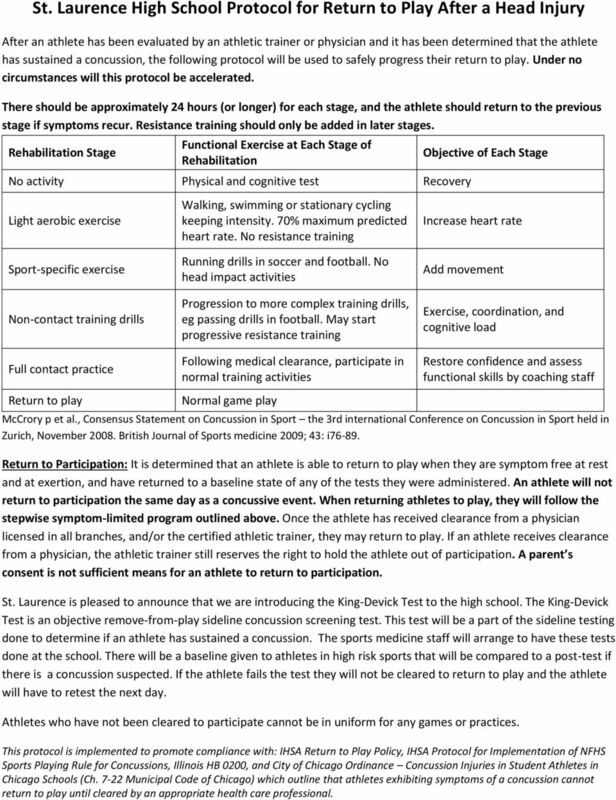 Concussion Information Sheet"
4 St. Laurence High School Protocol for Return to Play After a Head Injury After an athlete has been evaluated by an athletic trainer or physician and it has been determined that the athlete has sustained a concussion, the following protocol will be used to safely progress their return to play. Under no circumstances will this protocol be accelerated. There should be approximately 24 hours (or longer) for each stage, and the athlete should return to the previous stage if symptoms recur. Resistance training should only be added in later stages. Rehabilitation Stage Functional Exercise at Each Stage of Rehabilitation No activity Physical and cognitive test Recovery Objective of Each Stage Light aerobic exercise Sport-specific exercise Non-contact training drills Walking, swimming or stationary cycling keeping intensity. 70% maximum predicted heart rate. No resistance training Running drills in soccer and football. No head impact activities Progression to more complex training drills, eg passing drills in football. May start progressive resistance training Increase heart rate Add movement Exercise, coordination, and cognitive load Full contact practice Return to play Following medical clearance, participate in normal training activities Normal game play Restore confidence and assess functional skills by coaching staff McCrory p et al., Consensus Statement on Concussion in Sport the 3rd international Conference on Concussion in Sport held in Zurich, November British Journal of Sports medicine 2009; 43: i Return to Participation: It is determined that an athlete is able to return to play when they are symptom free at rest and at exertion, and have returned to a baseline state of any of the tests they were administered. An athlete will not return to participation the same day as a concussive event. When returning athletes to play, they will follow the stepwise symptom-limited program outlined above. Once the athlete has received clearance from a physician licensed in all branches, and/or the certified athletic trainer, they may return to play. If an athlete receives clearance from a physician, the athletic trainer still reserves the right to hold the athlete out of participation. A parent s consent is not sufficient means for an athlete to return to participation. St. Laurence is pleased to announce that we are introducing the King-Devick Test to the high school. The King-Devick Test is an objective remove-from-play sideline concussion screening test. This test will be a part of the sideline testing done to determine if an athlete has sustained a concussion. The sports medicine staff will arrange to have these tests done at the school. There will be a baseline given to athletes in high risk sports that will be compared to a post-test if there is a concussion suspected. If the athlete fails the test they will not be cleared to return to play and the athlete will have to retest the next day. Athletes who have not been cleared to participate cannot be in uniform for any games or practices. This protocol is implemented to promote compliance with: IHSA Return to Play Policy, IHSA Protocol for Implementation of NFHS Sports Playing Rule for Concussions, Illinois HB 0200, and City of Chicago Ordinance Concussion Injuries in Student Athletes in Chicago Schools (Ch Municipal Code of Chicago) which outline that athletes exhibiting symptoms of a concussion cannot return to play until cleared by an appropriate health care professional. 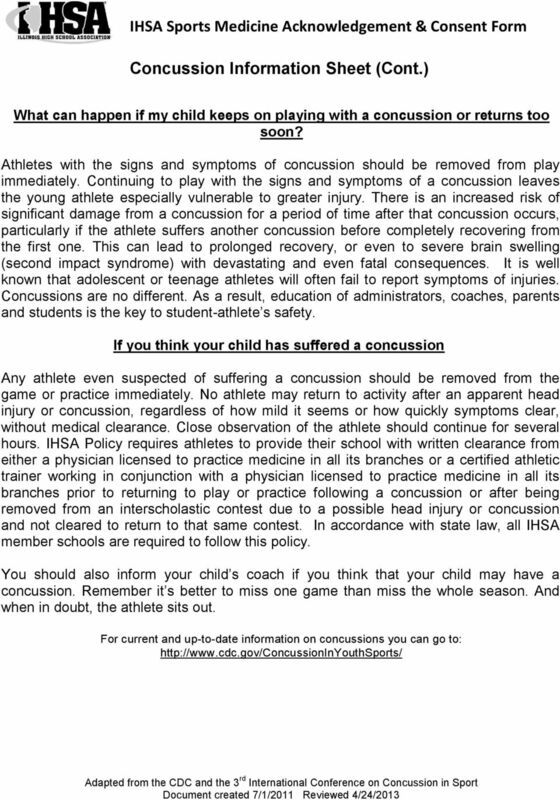 5 IHSA & St. Laurence Sports Medicine Acknowledgement & Consent Form Acknowledgement and Consent Student/Parent Consent and Acknowledgements By signing this form, we acknowledge we have been provided information regarding concussions and the IHSA Performance-Enhancing Testing Policy, and we agree to abide by the St. Laurence Protocol for Return to Play After a Head Injury. We also acknowledge that we are providing consent to be tested in accordance with the procedures outlined in the IHSA Performance-Enhancing Testing Policy. STUDENT Student Name (Print): Grade (9-12) Student Signature: Date: PARENT or LEGAL GUARDIAN Name (Print): Signature: Date: Relationship to student: Consent to Self-Administer Asthma Medication As a patient under my care,, is prescribed to self-administer the following asthma medication. Medication Purpose Dosage Time/Special Circumstances Printed Name of Physician Signature of Physician Date I,, do hereby give my son/daughter,, Permission to self-administer his/her asthma medication as prescribed by his/her physician during athletic competition. 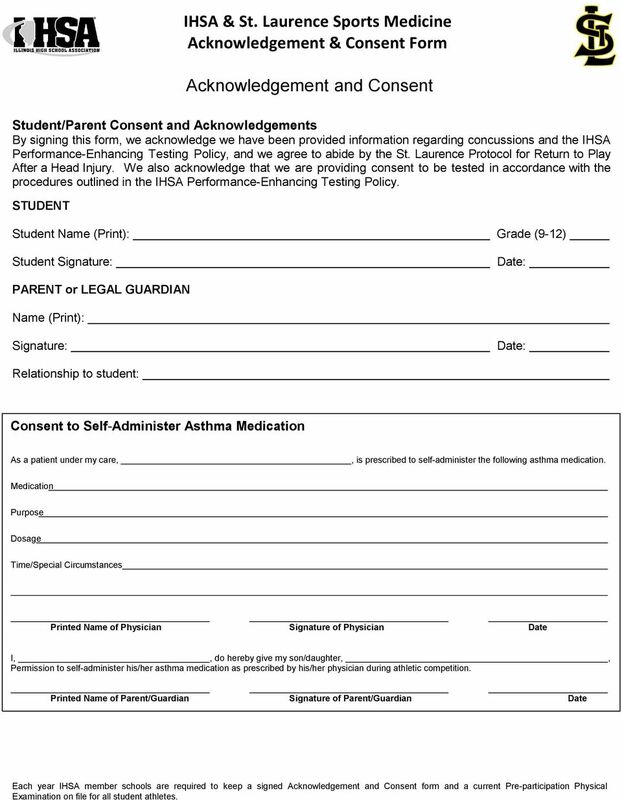 Printed Name of Parent/Guardian Signature of Parent/Guardian Date Each year IHSA member schools are required to keep a signed Acknowledgement and Consent form and a current Pre-participation Physical Examination on file for all student athletes. Defined as a complex process affecting the brain, induced by traumatic biomechanical forces. Baseball 2015 DATES June 22-24 Spartan Kids Day Camps Ages 6-12 years old Spartan Camp Ages 13-18 years old Directed by Head Coach Jake Boss and his coaching staff, along with current and former Spartans. Concussion Training for Coaches INTRODUCTION Each day in our nation, hundreds of thousands of young athletes head out to fields, ice and gymnasiums to practice and compete in a wide variety of sports. SOUTHWEST FOOTBALL LEAGUE CONCUSSION MANAGEMENT PROTOCOL NOTE: Revisions to the guidelines recommended in this Concussion Management Protocol will be made on an annual basis based upon current legislation. What is a concussion? 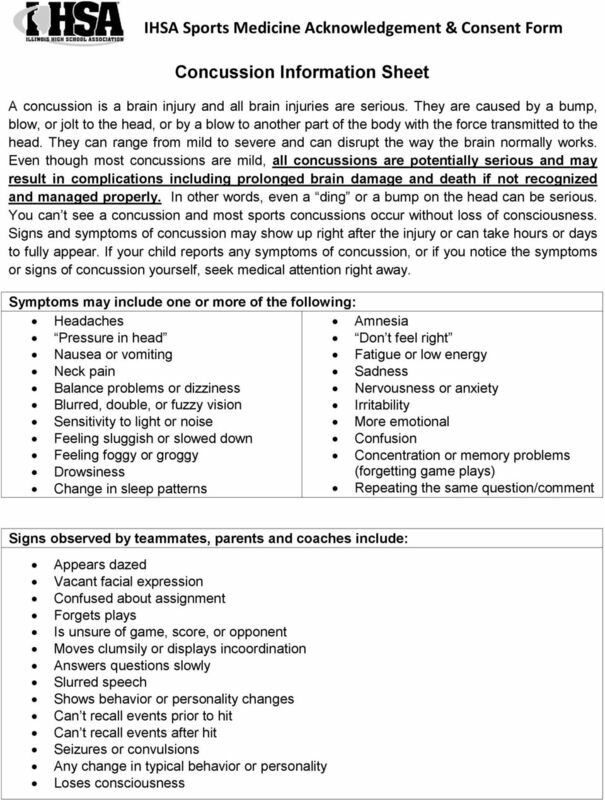 What are the symptoms of a concussion? What happens to the brain during a concussion? Head Injury Prevention and Management Policy (Concussions) Children and adolescents have the greatest risk for head injury and concussion. March 9, 2015 New Page 1 of 21 POLICY STATEMENT The Ministry of Education expects all school boards in Ontario to develop and maintain a policy on concussion as outlined in Policy/Program Memorandum No. This Summer We Train Like Spartans!